Carlton Laser Services Ltd (CLS) are specialists in producing precision sheet metal fabrications, providing complete solutions ranging from laser cut components to finished cabinets and control housing. The company based in Leicester, employs some 60 people and through continual reinvestment in state-of-the-art equipment, provides high-calibre services such as laser cutting, CNC punching, fabrication and assembly, and robotic folding. 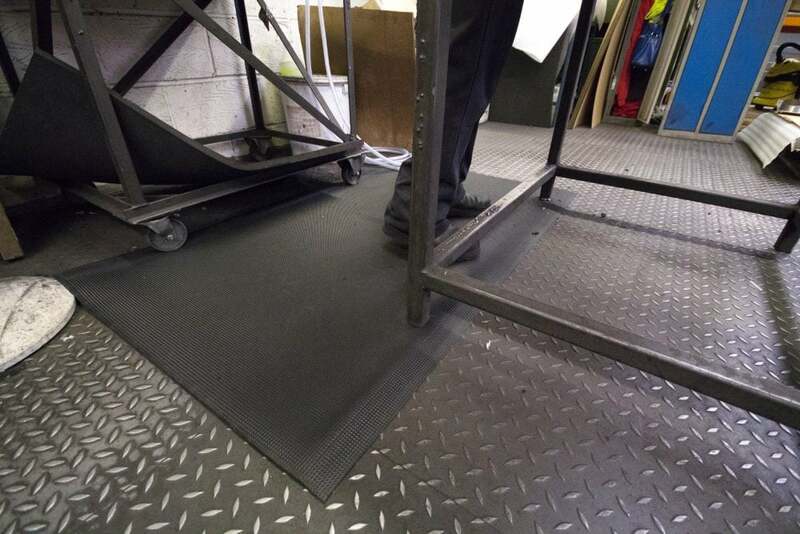 Many tasks require prolonged periods of standing and a variety of anti-fatigue mats supplied by COBA Europe Ltd have been installed in different areas within the facility. COBA Europe, with Carlton Laser Services’ permission, also invited employees to participate in a short survey to ascertain standing comfort levels both prior to, and after the mats had been installed. Two operatives work in this area and need to stand at the machine, which puts a grain into the material. A two shift system (day and night) is in operation requiring employees to stand for an average of 5 to 6 hours (with a 30 minute break), although not necessarily in a static position. High Duty matting has been installed next to the machine. While neither operative had experienced any back or foot pain previously from standing at work, they both considered the new High-Duty matting to be beneficial making “standing at work easier”, with one noticing the benefit to feeling ‘less-fatigued’ at the end of the shift. Both concluded that they liked standing on the matting. A key feature of High-Duty is its resilience in oily environments making it a good choice for use in areas housing industrial equipment and machinery. It is manufactured from a blend of natural rubber and nitrile. It is the nitrile content which gives High-Duty matting its superior resistance to oils and machine coolants. The matting has an open holed surface, which allows any liquid spillage to drain through the mat, therefore reducing the risks of slips. It conforms to Slip Resistance Test EN13552 Category R10. High-Duty also provides relief from standing on hard, cold concrete floors. It is available as a single workstation mat (edged all round) or in interlocking modular sections. Diamond Tread with its flame retardant top surface has been developed with welding bay applications in mind. With a fire test classification of Cfl-s1 it is the ideal safety matting solution for welders. The top surface of the mat has a heavy-duty ‘diamond tread’ pattern for better underfoot traction, while the underside (backing) is a foam composition, which provides cushioning and fatigue-relief for standing operatives. The mat comes with ramped edges all round, and is available in a variety of lengths and widths. Solid Fatigue-Step Tiles with yellow edging have been installed in the Laser Cutting area. This is where workers come specifically to clean the laser equipment, or to conduct any other maintenance. The machines run 24 hours a day and generally this area remains unmanned, and is only attended once or twice a day. Three operatives cover this area over a three shift period. 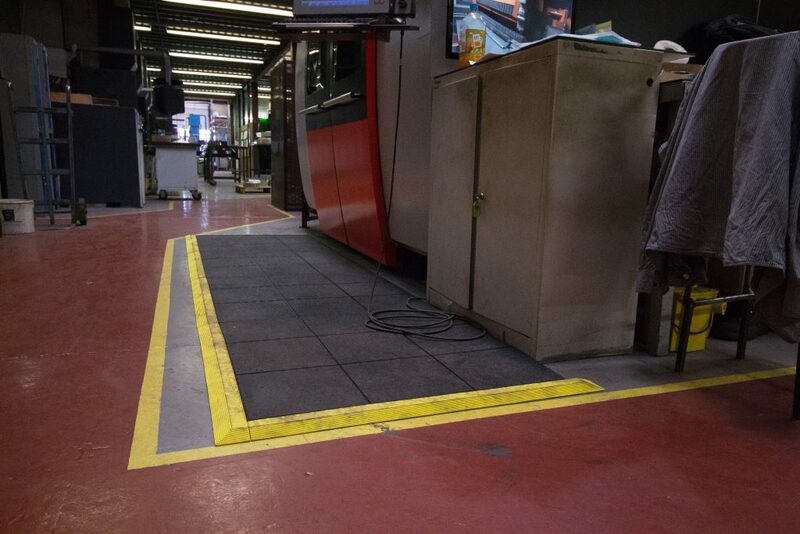 The tiles have been installed along the sides of the machines providing a safe and comfortable walkway for operatives when they need to access this area. The bevelled edging creates a ramp for pump trucks to be wheeled on and off the matting. COBA Europe’s Solid Fatigue-Step Tiles have a multitude of benefits in the industrial workplace. An interlocking industrial floor tile system, they are extremely versatile and while being very comfortable to stand on, they also create a smart finish to factory floors. These solid surface tiles can be interlinked to cover any width, and any length of work area, and can be moved from one location to another with relative ease. They are available as 100% nitrile, or as a blend of nitrile and rubber depending on the environment in which they are being used. The tiles conform to Slip Resistance Test EN 13552 Category R10 and are highly effective in helping to reduce fatigue from standing. Optional bevelled edging as used by Carlton Laser Services is available in yellow or black. This is an area were a lot of dust and grind waste is generated, and therefore one that needs regular cleaning. It houses air and inline grinders, and is where processes such as weld pickling takes place. Orthomat® Ultimate anti-fatigue mats have been installed replacing rubber mats with a waffle designed top surface. Two of the mats are laid on concrete, while the third is used on a mezzanine floor. Three operatives work in the Polishing Area and have to stand for the majority of their working day. All of them unanimously agreed that the matting has made standing easier, and helped to reduce the onset of fatigue. 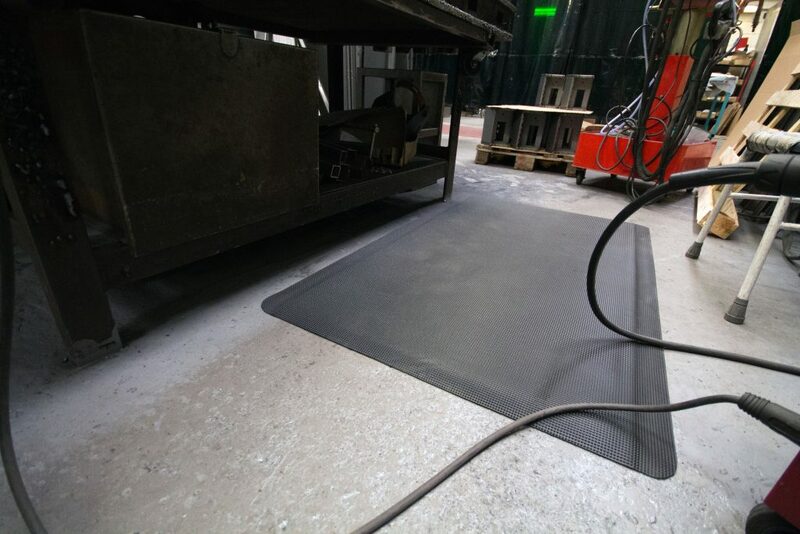 Orthomat® Ultimate is a breakthrough in oil/chemical resistant anti-fatigue matting. PVC foam products are not normally suitable for this type of environment, but Orthomat® Ultimate changes all this, as a result of material and manufacturing technology from COBA Europe. Orthomat® Ultimate is a high-density foam anti-fatigue mat giving underfoot support. It has a unique flame retardant outer layer manufactured from a revolutionary PolyNit material which completely encapsulates the soft foam inner, and has heat-sealed tapered edges for total protection. The matting has been developed specifically for use in oily, wet or chemical prone environments and unlike heavy rubber matting, is available in easy to handle rolls. The extremely durable raised textured top surface is ideal for trapping swarf, and in Carlton Laser Services’ case, grind dust. Even sharp debris will not pierce the mat’s surface. While only two of those questioned had previously experienced back, leg or foot pain from standing at work, 100% respondents considered that the installation of anti-fatigue matting had made standing at work easier and more comfortable. Over 86% considered that matting had reduced the feeling of fatigue at the end of each shift. 100% of respondents said they would recommend the use of anti-fatigue matting and all participants agreed that if they were moved to an area without a mat, they would request that matting should be installed.